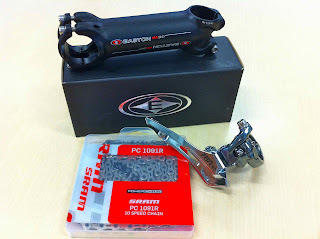 Easton EC90 stem, SRAM PC1091R chain and Force front derailleur. It's all coming together, I'm just waiting on two more shipments before the fun of building up the dream machine can commence. UPDATE: And I goofed up and ordered too long of a stem. Damn. I should have followed the old saying - measure twice, order once. Or something like that.